GateIn 3 out of the box experience doesn’t show much and is not very appealing. 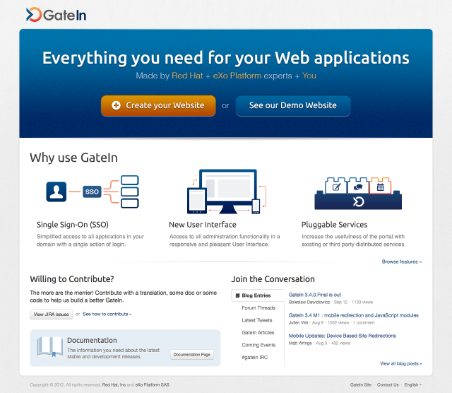 In face of these problems, we've worked on a redesign for the first page displayed after the installation of GateIn, which we call "Welcome page". It will probably be deleted after some configuration, but it is very important as the first contact with the product and reflects directly in the user experience of it. The page was designed based on the new visual style for GateIn, which is explained on the article "New GateIn User Interface". It is a brand new design that seeks to replace the old interface with its 90's visual style by a more modern and pleasurable visual style. It is also consistent with the Administration UI redesign. What are your comments about it? By the way I haven't commented but I really like it, invitation to create a new site is neat.